In February 2019, hotel establishments in the Basque Country registered a 5.5% rise in visitor numbers. Thus, there were 179,108 visitors, 9,371 more than in February 2018, according to Eustat data. Visitor numbers increased in all provinces: in Gipuzkoa by 9.9%, in Bizkaia by 3.5% and in Álava by 1.0%. Furthermore, overnight stays reached 325,858, which was an increase of 7.1% on those registered in February of the previous year, that is, there were 21,475 more overnight stays. There was also a positive year-on-year trend in overnight stays in the three provinces: in Gipuzkoa they increased by 7.2%, in Bizkaia they rose by 7.0% and in Álava they were up 6.7%. The number of visitors from within Spain rose by 6.2% in the Basque Country compared to February of the previous year, whilst the number of visitors from abroad increased by 4.1%. Álava registered a 0.2% increase in visitors from within Spain, and a rise of 5.1% in visitors from abroad. In Bizkaia, the number of Spanish visitors was up 6.0%, while the number of visitors from abroad decreased by 1.9%. In Gipuzkoa there was a 9.3% increase in visitors from within Spain, and a rise of 10.9% in those from abroad. The average length of stay this February was 1.82 days, an improvement upon the 1.79 days average stay registered in February 2018. In Álava there was an increase from 1.77 days last year to 1.87 days in February this year; in Bizkaia it rose from 1.82 days in February 2018 to 1.88 days this February; and for its part, the average length of stay in Gipuzkoa was down from 1.77 days in February 2018 to 1.72 days this February. There was an increase of 2.3 percentage points in the bed occupancy rate for the Basque Country overall, reaching a rate of 42.2% in February this year. In Álava, there was a rise of 4.2 percentage points, with bed occupancy rates reaching 39.8% this February. Bizkaia saw an increase of 3.0 percentage points, with a rate of 42.4% this February. In Gipuzkoa the occupancy rate was up 0.7 percentage points, reaching 41.0 % this February. The occupancy rate per room also registered an upward trend, with a 2.8 percentage point increase for the Basque Country overall, reaching 54.0%. In Álava it was up by 5.4 percentage points, standing at 51.8%; in Bizkaia it increased by 3.7 percentage points to reach 57.6%; whereas in Gipuzkoa it rose by 0.7 percentage points, standing at 50.3% occupancy per room. The Bilbao saw the highest hotel bed occupancy rate in February (47.7%), followed by Bizkaia coast (46.7%) and Donostia / San Sebastián (44.8%). Taking into account the day of the week, at weekends there was a higher occupancy in the Basque Country as a whole in February 2019, with 54.0% of places occupied, whilst the registered occupancy stood at 37.4 % on weekdays. Finally, with regards to the profitability indicators of the sector, the average daily rate (ADR) of hotels in the Basque Country stood at 66.8 euros in February 2019, 2.6% down on the year before. The average rate stood at 57.7 euros in Álava, down 9.7%; 69.3 euros in Bizkaia, with an increase of 0.5%, and 66.5 euros in Gipuzkoa, where it fell by 4.5%. The revenue per available room (RevPAR) in the Basque Country overall, which is dependent on the occupancy rate of hotel establishments, stood at 36.1 euros in February 2019, a 2.7% increase on February 2018. The RevPAR stood at 29.9 euros in Álava, 39.9 euros in Bizkaia, and 33.5 euros in Gipuzkoa. There were 6,160 visitors to rural accommodation in the Basque Country, 3.4% more than the same month of the previous year. By province, in Álava the number of visitors was up 1.0%, in Bizkaia there was a drop of 8.9%, and in Gipuzkoa there was an increase of 10.3%. The 774 visitors originating from abroad signified a rise of 16.0% with regards to those received a year ago and represented 12.6% of the total number of visitors. For its part, the number of visitors from within Spain rose by 1.8%. Rural tourism establishments and country cottages in the Basque Country recorded a total of 13,639 overnight stays in February, with an increase of 7.8% with respect to the same month of the previous year. By province, in Álava they were down 1.4%, however in Gipuzkoa they increased by 7.2 % and in Bizkaia they were up 14.9%. The bed occupancy rate stood at 13.9% with a rise of 1.6 percentage points from the figures obtained in February 2018. In Álava it increased by 0.4 percentage points, standing at 9.5%. In Bizkaia the occupancy rate was 13.9%, with an increase of 2.6 percentage points in relation to February 2018, and Gipuzkoa was up 1.4 percentage points to reach an occupancy rate of 16.2% in February this year. 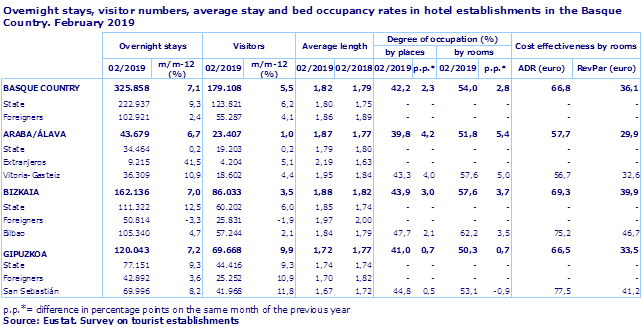 Finally, the average length of stay increased, going from 2.12 days to 2.21 this last month.